Laurie Colwin, cook, food writer and novelist, felt that a picnic was a good excuse to eat a whole bag of potato chips all by yourself. Besides expressing an understandable fondness for potato chips, her point is that picnics are occasions for eating in ways out of the ordinary. They have their own rhyme and reason and shouldn’t be an outdoor replica of an indoor menu. Picnic food is eclectic. The only real requirement for admission besides how it tastes is that the food be a good traveler. 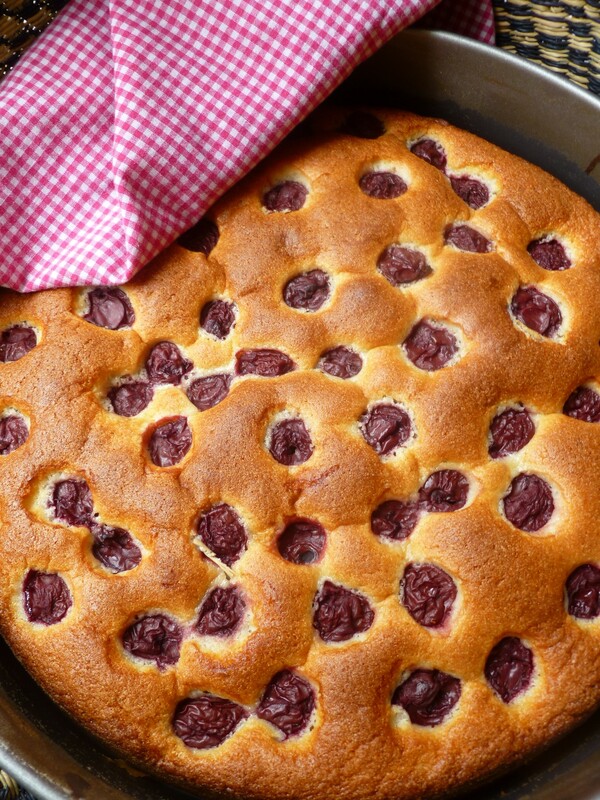 Sour Cherry Cake is not fragile. It is made from a swift little recipe that will give you a fine result the first time…and every time–unless, one bakes with such winged speed that the batter goes in the oven before the flour has been added. Even then the mistake may be undone on a second try with remarkable ease. And while you wait for this delicious cake to bake, you can relax, download a video of Neal Diamond singing Cherry, Cherry…and dance. a 15-ounce can of Sour Cherries, drained or a 350-gram can of Sour Cherries, drained: Can sizes vary from country to country. 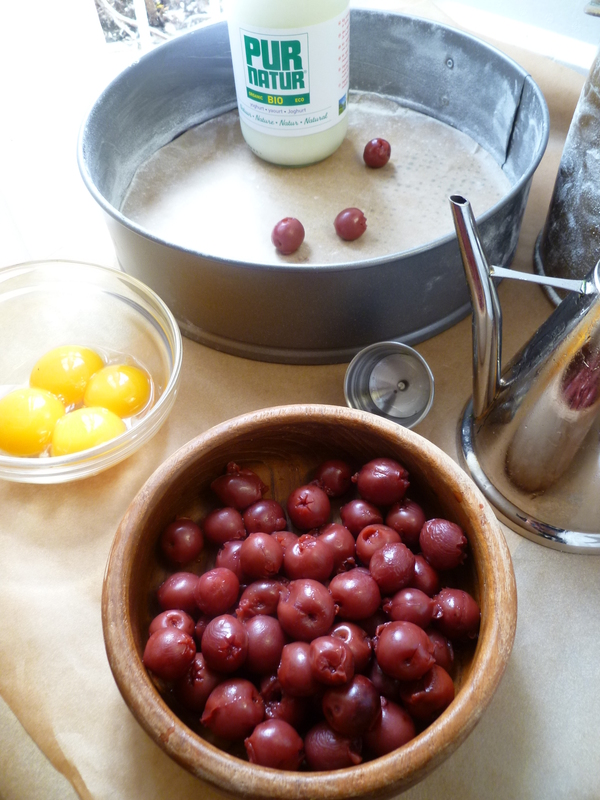 The measure of cherries doesn’t have to be exact–about 1 cup is sufficient. 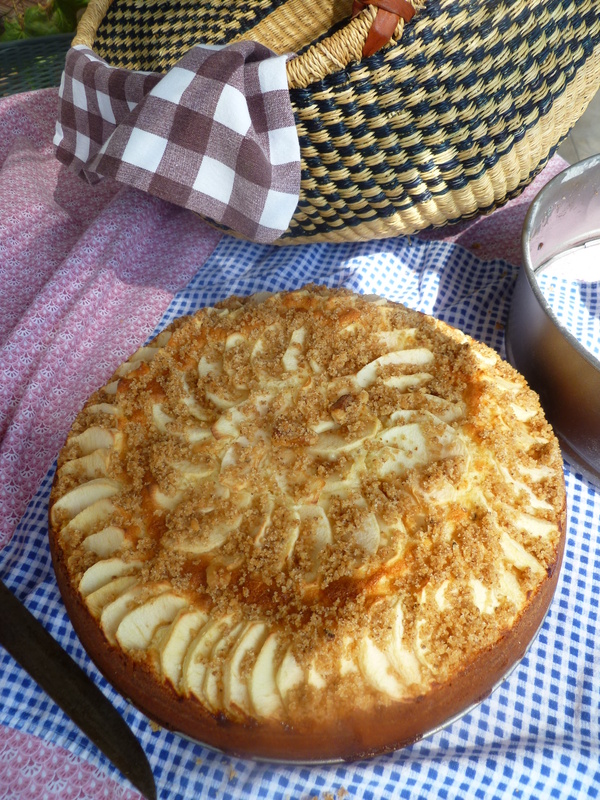 Optional: Whipped Cream to serve with the cake; since it is included in the Menu: Into the Picnic Basket, the whipped cream isn’t used and doesn’t appear in the photos. Without it, the cake is still excellent. a Springform Cake Pan, measuring 10-inches across the bottom, buttered and floured and lined with Parchment Paper: This is the pan used to make the photographed cake. It is a convenient one for transporting it. A rectangular pan might also be used–although the diplomatickitchen hasn’t tried it. 1. Butter and flour the cake pan and line it with parchment paper. Preheat the oven to 400 F.
3. Beat the egg yolks and sugar together in a second bowl. 4. Add the yoghurt to the egg and sugar and beat some more. 5. After the yoghurt is mixed in, add the oil and vanilla and beat again. 7. Beat the egg whites until they hold peaks and stay where they are when the bowl is turned upside down. 8. Fold the egg whites into the batter and pour the batter into the pan. 9. Bake the cake for 5 minutes in the 400 F. oven. At the end of 5 minutes, carefully slide the cake out on the oven rack. Don’t remove it from the rack. 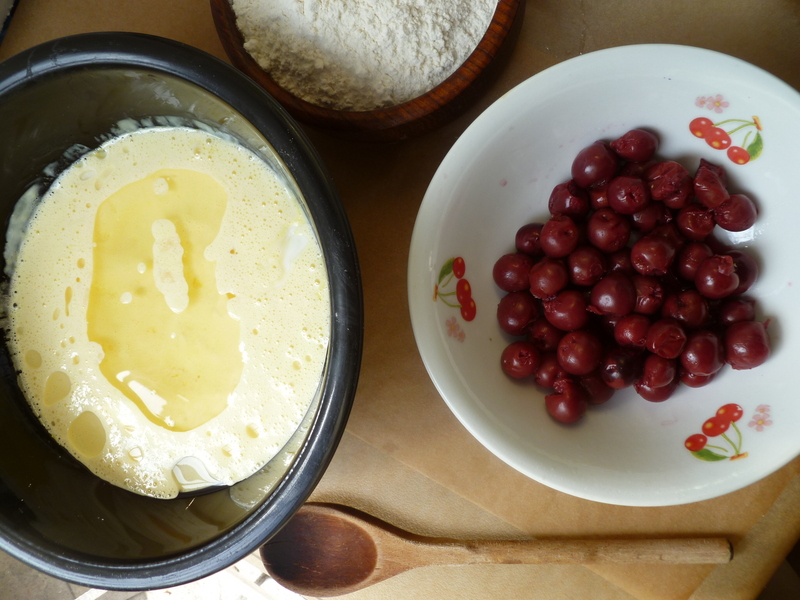 Place the cherries around on the surface of the cake and slide it back into the oven. Bake it for 30 minutes more. (Putting the fruit on the cake as it sits on the oven rack is a way of keeping the rising batter from sinking. 10. Cool the cake in the pan. Leave it there if it is going to a picnic and slip the springform ring off it in situ before slicing it. 1. Make some Ground Walnuts and Sugar, by toasting some walnuts in a dry pan, grinding them in a food processor and mixing them with some sugar. Photos and steps for Sugared Ground Walnuts are here in a previous diplomatickitchen recipe. 2. 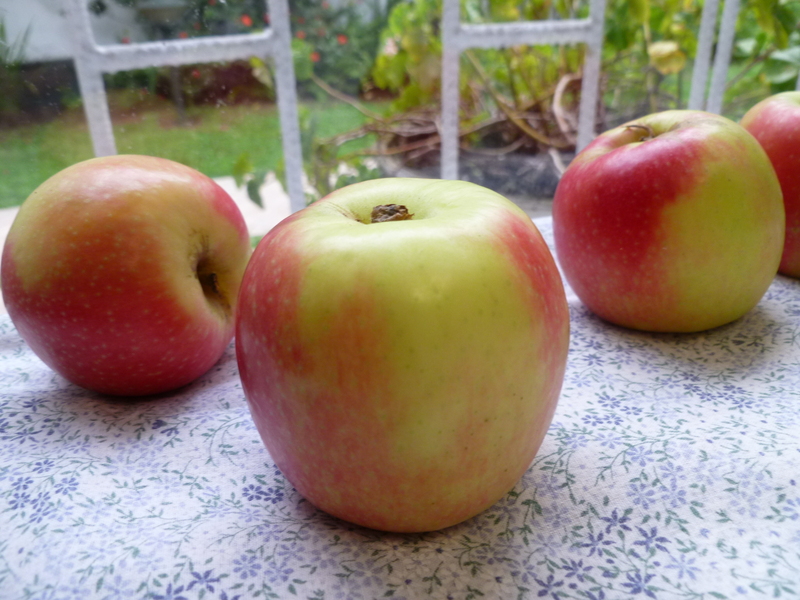 Peel and slice thinly a few apples. (Three were used for the photographed cake). Mix the slices with a Tablespoon or so of lemon juice. 3. Mix the cake batter, and, after 5 minutes of baking, arrange concentric slices of apple over the top and sprinkle them with sugared ground walnuts. 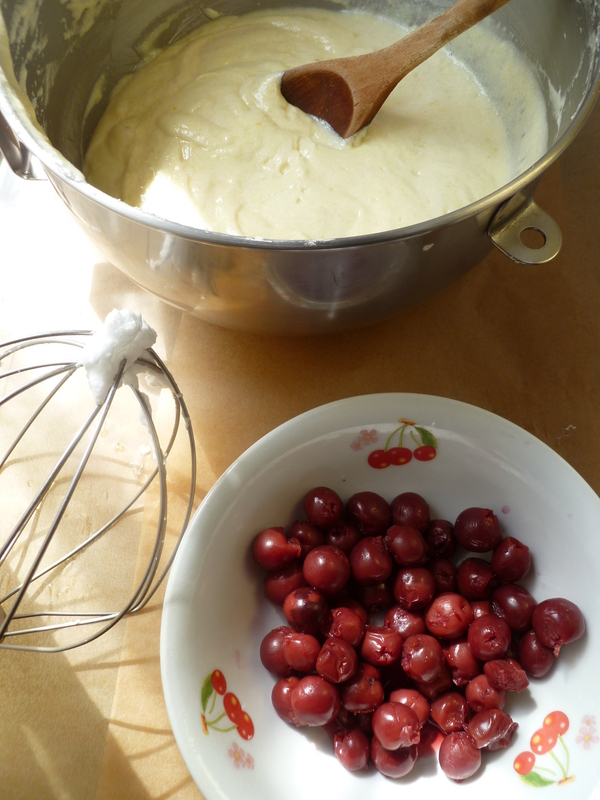 As for the Sour Cherry Cake, bake 30 more minutes. 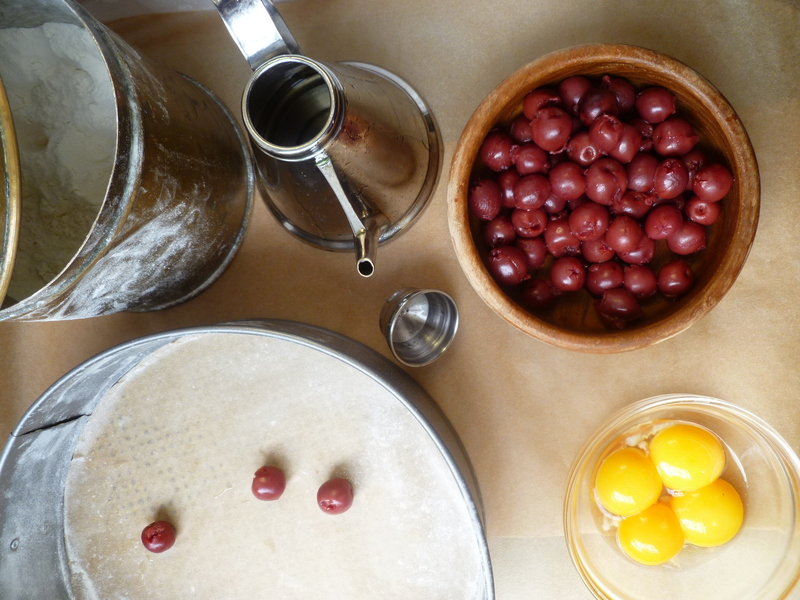 A Note: Nena’s Croatian Sour Cherry Cake is in the basket of the Occasional Menu: Into the Picnic Basket. 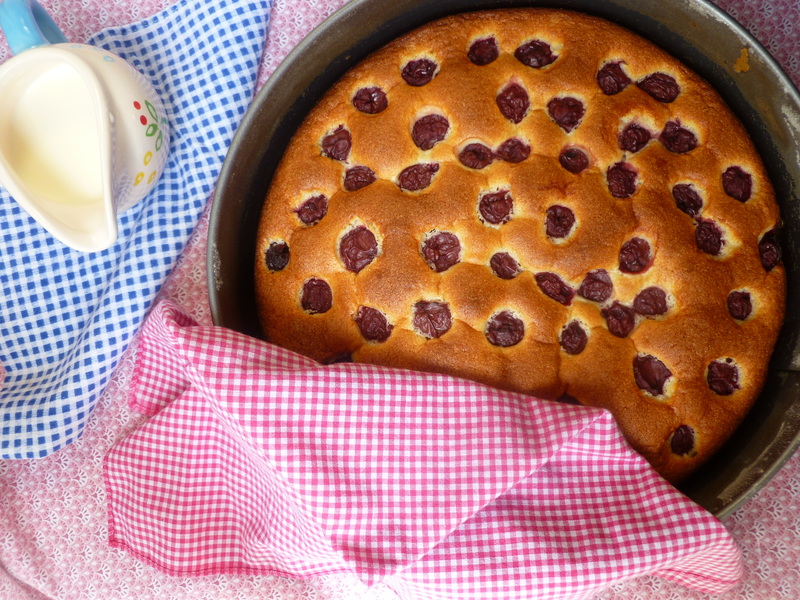 An Acknowledgement: Croatian Sour Cherry Cake is a recipe by Nena Scott. Like this cake, Nena is a good traveler and for almost thirty years has been making temporary homes all over the world. Presently, she is living in Milan, Italy, where her husband is the U.S. Consul General. Nena knows how to cook and knows how to make a large party of dozens of guests feel individually welcome and happy to have been invited to her home. Thanks for the credit – but really, credit goes to you ! You have documented it with beautiful pictures that are worth more than a thousand words ! Dobar tek ! Don’t be so modest. This is a seriously good cake. What a neat, simple set of directions…seems like one should have to put in more effort to get something this nice. seems like a classic, just like Nena. I must try this over the coming weekend. I am sure this item is as dilicious as all the items Nena prepares for her family and guests. She is a wonderful cook and equal as talented in being a gracios hostess. Over 20 years ago I stayed in then Yugoslavia with a Croatian family I knew in Australia. 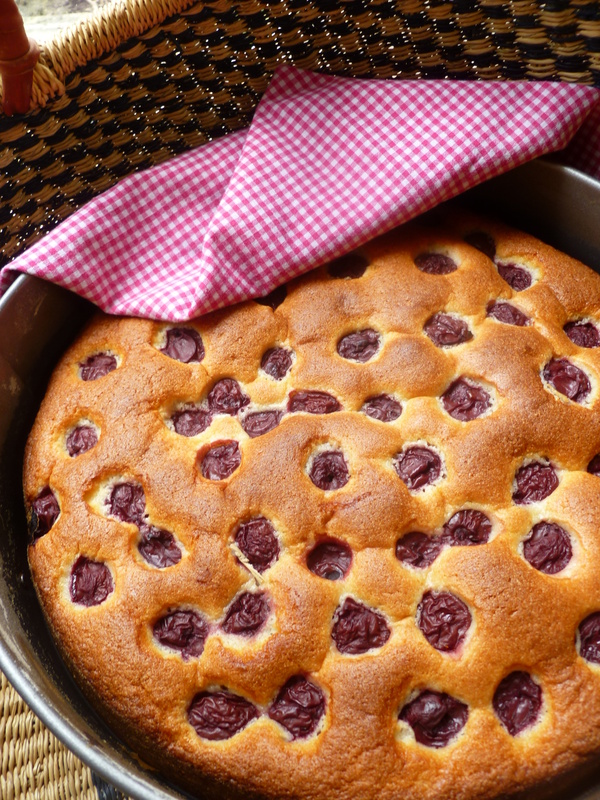 We made a cake very similar to this using fruit that was readily available in the garden very similar to cherries but sour to eat if they were not baked into the cake. I loved not only making this cake with my host Maria but eating it too! Brought back wonderful memories and I can’t wait to try this out. I know what you mean–how some foods have an extra dimension to them of taking you back to people and places from the past. I feel the same way about certain Hungarian dishes…they hold good memories. hi I’m Nieves, I made this cake with your recipe. I could not get cherries remain on the surface, but I’m very happy with the result. I have a blog and I posted my version in Spanish of your recipe.